It's an adorable shell for pre-folds, but the velcro had just stopped holding. We put the diaper in the "cannot use unless it's a dire emergency" pile...until now! KAMsnaps has come to our rescue and saved this diaper (and I'm sure will save many others in the future). Basically, KAMsnaps sells all of the tools and materials you would need to replace your velcro with snaps. It even has tutorials for how to replace snaps on certain types of diapers. I used the bumGenius tutorial as a guide for replacing the snaps on this shell, and it worked. Now for the process... I had a bit of trouble. Well, make that a lot of trouble. :-) I am not the most artistically creative person, and crafty things make my head spin. Not only that, but I read the directions partially wrong and that kinda made things MUCH more difficult than it needed to be. First, you need to take off the velcro. It took me nearly an hour to cut and pick the threads away, but that was to be expected. There are lots of threads!! Here is what the diaper looked like during the "in between" stage. Then, you need to measure and affix the snaps. The pliers that KAMsnaps sent were fantastic...once I figured out how to use them. This was where I read the directions wrong on two accounts. First, I didn't put the correct side of the snap (the socket) on the front of the diaper. Not only that, but I was using the pliers backwards (with the cap on the side where the metal part should come down into the middle of the socket). That made for a VERY difficult hour of trying to figure out why the heck it wasn't working right. It wasn't until I had put all of the wrong types of snaps on the front and was working on the tabs when I realized BOTH of my mistakes. I read a bit more in the directions and finally figured it out. I then went back, replaced the wrong ones, started using the pliers correctly, and what do you know it took no time at all. lol Here's the finished product! The snaps all work perfectly (I checked), and they look almost as if that's the way the diaper originally came to me. Woo hoo!! Now whenever a velcro dies, I'll be able to resurrect the diaper as a snappy. No need to through out worn out velcro diapers, just change them into snappy ones! 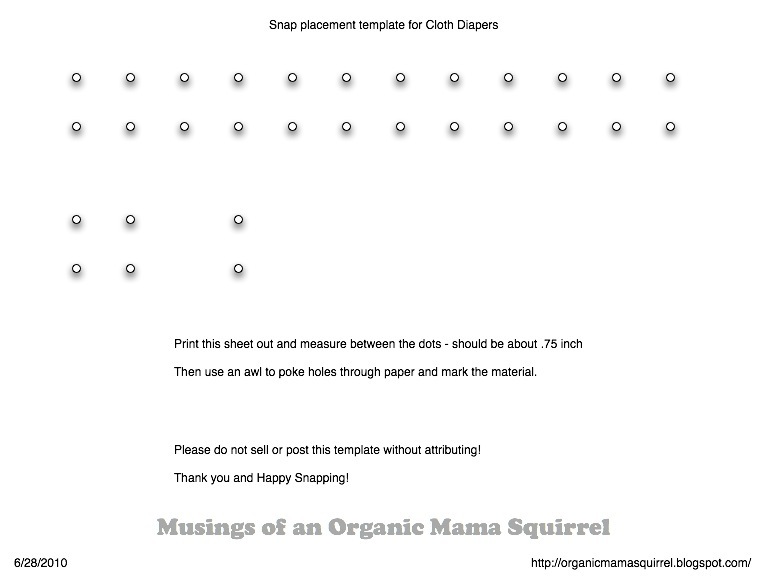 The snaps themselves are quite inexpensive, so if you make a mistake it's not a big deal. Once you get the hang of it, the work goes quickly. The pliers come with EVERYTHING you will need to replace the snaps on all of your velcro diapers. You can also use the pliers for other craft projects unrelated to cloth diapering. Snaps come in many, many assorted colors, styles and designs. It's *very* time consuming, even when you know what you're doing. Taking off the velcro is nearly an hour, and I'd budget another 1/2 hour for actually putting on the snaps (more if you're going to do two rows of snaps). The pliers to apply the snaps are somewhat expensive (about the cost of two to three cloth diapers), but at least you only have to buy it once. Overall: I give KAMsnaps pliers & snaps 9/10. The price of the pliers with snaps evens out once you've saved two or three diapers that would've otherwise been thrown out, but it does take a lot of time and effort to change over just one diaper. Sure, it will take less time as you get good at it, but learning takes time. One of you very lucky readers out there will get to win a $25 KAMsnaps gift certificate! Visit the KAMsnaps website, comment here and tell me which is your favorite color/style of snap. 2) Follow @KAMsnaps on Twitter and comment here with your Twitter screenname. 5) Become a fan of KAMsnaps on Facebook. 11) Subscribe to The Twinners emails and comment here after you've confirmed your subscription. 12) Blog about this giveaway, make sure to directly link to this post and comment here with the URL for 2 additional entries (be sure to leave two separate comments). 13) Add my button to your blog and comment with the URL of your blog for 2 additional entries (be sure to leave two separate comments). 15) Enter my Baby Pool and comment here with the name you used to guess. 16) Join Swagbucks using this link. 17) Vote for this blog by clicking each of the following icons for 1 additional entry per click (a total of 5 additional entries), and you can do this once per day! Make sure to comment 5 times every day that you click to let me know you clicked for each one. This giveaway will close on July 19, 2010 at midnight. We were sent the KAMsnaps pliers and snaps free of charge for the sole purpose of this review; no other compensation was received. All opinions expressed are my own. I really liked the combo pack, so that you can match to the many different diapers! The Engraved - Ooga Booga snaps are so cute! Subscribe to KAMsnaps' mailing list. My favorite snap is the BG Blossom because I have a lot of bumGenius diapers in blossom with aplix that needs to be removed! I love the snaps engraved with a mouse. So cute!! I'm in your EcoUsable giveaway. I entered your baby pool. I like the pink & orange..sis is due ANY DAY.. Fan of The Twinners Reviews & Giveaways on Facebook. Follow this blog on Networked Blogs. Voted for this blog on Baby Boutiques! Voted for this blog on Top 100 Blogs and Websites! Voted for this blog on Top Mommy Blogger! I love the black snaps! Fan of KAMsnaps on FB! I love the look of the painted snaps, so many options!